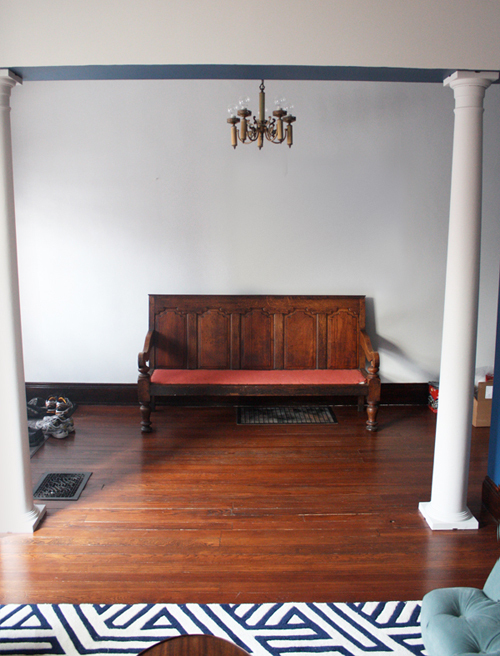 Since we moved in months ago, I've been looking for a bench for the entryway. Preferably something that would match the style of the house and the dignified entry. Walking in the front door, you face a staircase and to the right are pillars. Pillars! 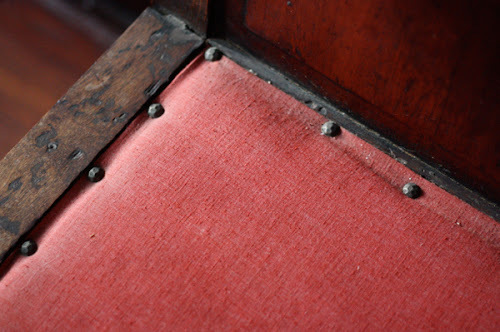 I love modern, but an antique church pew seemed like just the thing. I've been searching Craigslist and secondhand stores religiously (ha) for months, but couldn't find just the right piece of furniture. And then last weekend, I came across this beauty at an architectural salvage store. They'd had it a week. 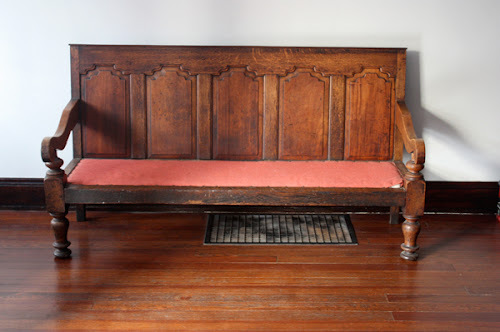 According to the previous owner the bench is European and dates from the 1830's. A neighbor thinks it was a courtroom bench. It's six feet long, built using pegs, and very sturdy. The seat could use a little more cushioning and the faded red fabric should be replaced, but that's a fun project. It's exactly what I was looking for. Happiness! It looks so perfect! And it matches your lovely hardwood floors as well. Yep... it's perfect! I'm so glad you can finally put on shoes... winter's comin', y'know. Actually, it arrived here today. With a vengeance. It's gorgeous. Congratulations. Good hunting. Great find! Will you reupholster it or leave it as it is? I second court room bench btw. In some of our old court houses on the countryside (in Austria) they still have those kind of benches. Congratulations! It's really really pretty! Love it. Perfect fit for the entryway. Great find! You found a gorgeous treasure in your bench. I'm both happy for you and super jealous. it is gorgeous, and looks right at home. congrats on the find! Please, could you tell me where did you find the chandelier on the second picture? thank you. 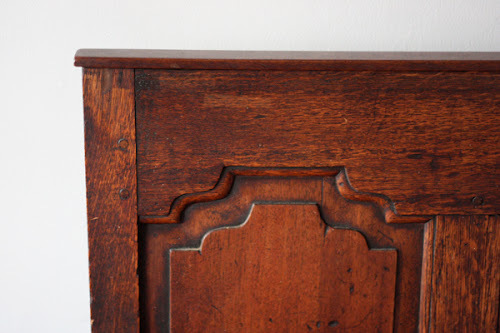 That is really beautiful - that wood grain is gorgeous! What a perfect find. Sweet find! The bf and I are moving into an apartment with a nice foyer area and we're also looking for a cushioned bench for peeps to take their shoes off. Yours looks lovely and I can't wait to see how you jazz it up with some new fabric. Anonymous, the chandelier was here when we moved in, so I have no idea when it was purchased or from where. Dorkys, yes, I'm debating about fabric... solid or print? What to do? A fun question to ponder. When are we going to get a full house tour?! I'm dying to see the whole place. Kelsey, not sure yet. It's only half done, so I'm kind of waiting until I don't have bare, empty walls anymore. Plus I'm trying to figure out how to take decent, non-blurry pictures in rooms that don't have much natural light. It's hard! A couple rooms don't have overhead lights, so we want to install some fixtures. I'm so enjoying following along as you make your new house a home.